"A new beginning" Children sit in a crowded classroom during lessons at the Gramya Resource Center for Women in Devarkonda Village in the Nealgunda District outside of Hyderabad. The center provides a home for girls who have been rescued from lives of labor and bonded labor. The girls study, eat, and sleep at the center and will stay there until it is safe to return them to their families or until they are old enough to go out on their own. 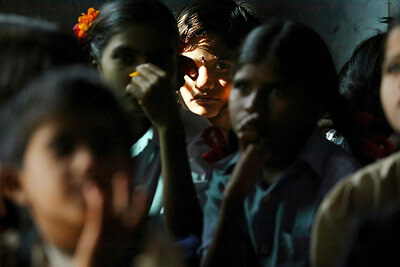 Child labor is one of the largest problems facing Indian children. Many children are coerced or forced in to lives of labor and will never have the chance to make it into the adoption system or have the opportunity to be adopted by foreign or Indian families.